Despite the popular success of Carmina Burana, Orff isn’t very highly considered in some high-browed musical circles, because his music is seen as based too much on simplistic processes that are too effective to be entirely honest. 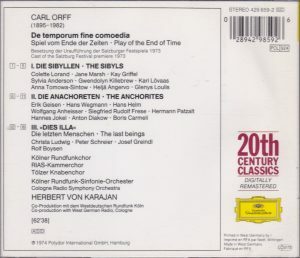 I happen to enjoy Carmina Burana very much, but I’m also fond of Orff’s later compositions, and especially of Antigonae (1949), his setting of Hölderlin’s translation of Sophocles’ play, in which he sought to recapture the way tragedies might have been played in the days of the Ancient Greeks, a mixture of percussion, chant and declamation. 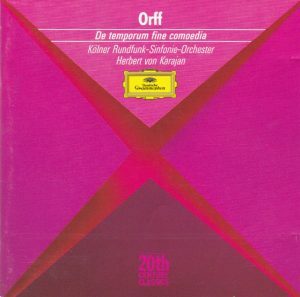 So I was curious to hear this work, Orff’s last large stage work from 1973. After and beyond Carmina Burana, and as endearing and popular as that piece is, Orff definitely invented, starting with Antigonae, a style that is entirely his own, and immediately recognizable. That style didn’t change much thereafter, as De Temporum… bears witness. It is sparse, ritualistic, processional, declamatory, repetitive, with short outbursts of tintinnabulary percussion. The orchestral lineup is quite unusual, with a huge array of percussion (over 100 instruments requiring 25 to 30 performers) including many rare, exotic instruments, harps, three pianos, two organs, wind machine, tape, a large section of woodwind and brass, while the strings are limited to four violas and twelve double-basses. There are short, highly chromatic and dramatic women’s melismatas, as the one that opens the disc. Some moments are highly dramatic, like those written in strongly pulsing rhythmic speech accompanied by heavy-pounding percussion, evocative of some primitive dance as seen by the Western eye, a style reminiscent of Darius Milhaud’s in his 1922 Les Choéphores (track 5 and 6). But there are also many moments that are austere, close to spoken language, like a ritual or a processional. “De Temporum Fine Comoedia” is a “Play on the End of Times”. The “Comedy” is to be taken in the ancient and medieval sense: a play that doesn’t end in a catastrophe. Orff’s libretto collates mystical texts from the late hellenistic or Roman era (the Sibylline Oracles from the 2nd Century BC, the Orphic Hymns from the early Imperial era) and equally mystical texts of Christian inspiration (excerpts from Origen, the Christian theologian from the 3rd Century, and the 11-13th Century collection of songs Carmina Burana from which Orff had already drawn in his most famous composition), all dealing with visions of apocalypse and the end of the world. Unlike Orff’s other stage works (including the triptych of Greek tragedies, Antigonae, Oedipus der Tyrann, Prometheus), there is no “plot” per se, but more a collection of visions, pronouncements, prophecies. Part I, The Sibyls, is written for women’s voices, Part II, the Anchorites (early Christian ascetic hermits) for men’s voices. It all ends, in part III (Dies Illa), very dramatically, with The Last of Mankind after the world’s destruction, but then Lucifer appears, not as the Prince of Evil, but repenting, returned to his former self as the Prime Archangel, the Bearer of Light. From a great distance, an eerie chorus (pre-recorded I think) can be heard (Vox mundane, the worldly voice), over which two solo voices (tenor and mezzo) sing the words (in Latin): “I come to Thee. Thou art the Comforter and the Ultimate Goal”, answered by another distant chorus, vox celestis: “All is Spirit”. An instrumental coda for four violas, a dirge in Renaissance style, concludes the work. One may not give a hoot about all this mystical mishmash (and I don’t), but it does provide Orff with a vehicle for genuinely… Orffic music: percussive, animated by a strong sense of pulse, often austere. Certainly not as seductive and colorful as in Carmina Burana, but very typically the composer’s. 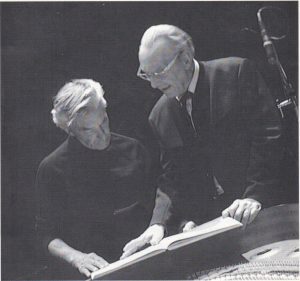 The recording was made by the very same forces that premiered the piece in Salzburg in 1973. The cast is stellar – starting with Karajan, in one of his rare forays in contemporary music, and away from his customary (in those days) Berlin or Vienna Philharmonic. No less than Christa Ludwig and Peter Schreier make a 2-minute guest-star appearance as the two solo voices at the end of the piece and Kari Lovaas, Anna Tomowa-Sintow, Boris Carmelli, Joseph Greindl are members of the cast of 21 vocal soloists (plus one speaking actor). And among the concluding viola quartet: Sigiswald and Wieland Kuijken. There is one big drawback, though, in the fact that the libretto is not provided. The synopsis will give the gist of what is being sung but not much more, since, as already mentioned, there is no real plot that can be summarized but a collection of cryptic prophecies and utterances. 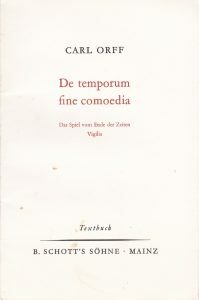 The libretto has been published by the score’s publisher, Schott, ISBN 3-7957-3643-9, but it won’t help much either: De Temporum uses texts in ancient Greek (the Sibyl’s Oracles), Latin and German – part 1 is exclusively in Greek and the two other sections mix all three languages – and, first, the Greek text is printed in Greek alphabet: I had to muster old memories from my three months of Russian in College to get a vague notion of what was being sung, when. Incidentally, I find it striking how much Ancient Greek sounds (to my ears) like Swedish. If I hadn’t known what language it was, I’d have thought I was in an opera after a Bergman film. There are also short passages where it evoked Hebrew. Not that I am fluent in any of these languages anyway. Second, only German translations of the Greek and Latin texts are given. Quite an intellectual exercise, that: to try and follow the Greek alphabet, then jump to the side page to make out what is being said from the German. For a first encounter with Orff, definitely go to Carmina Burana. For those wishing to explore more and hear Orff’s later style, I’d strongly recommend Antigonae: it is more dramatic and effective. If you are taken by Antigonae, then come to this CD.